Most organizations capture log data that could indicate a breach occurred. Yet not a single breach investigated in the Verizon 2011 Data Breach Investigation Report was detected through log analysis or review. 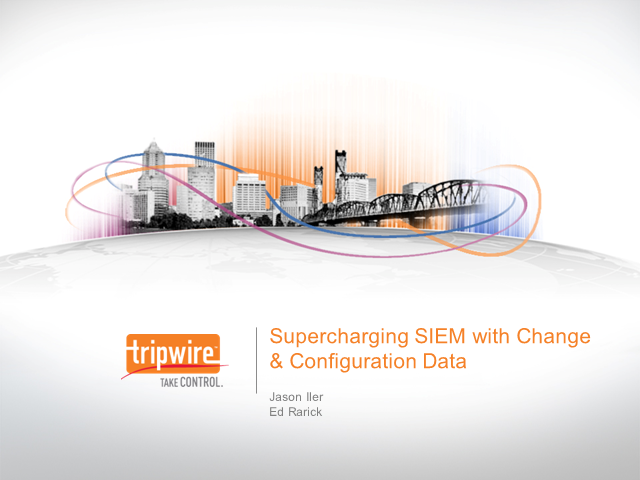 Learn how adding Tripwire Enterprise change and configuration data makes all the difference in detecting critical events. •How they can detect key indicators of a threat earlier in the threat kill chain to avoid or limit the financial damage as well as the damage to their reputation. •The importance of end point security across your business critical systems, including your POS systems. •How implementing critical security controls can make you an unattractive target. •Discuss how the Council on CyberSecurity uses a community approach to this translation problem to create and sustain the Critical Security Controls. • Discuss how human resources, legal and IT can work together to help prevent insider threats before they become a problem. • Identify risk indicators with employee attitudes and behavior and how it correlates to their patterns of activity on your network. • Show how you can use log intelligence and security analytics to automate actions and alerts and rapid reporting and forensics. Tim Masey, Director of Enterprise Information Security at AAA, will share his company’s PCI journey. •How to move your PCI efforts from a small tactical implementation to a key critical component of your security posture. •How to align your compliance efforts with the needs of the business, which will allow you to gain more resources—financial, human and technical. •How to utilize security and policy driven dashboards to get your management’s support. •Which systems can be trusted? •What is the extent of the compromise? •How quickly can you attain situational awareness? Jason will also provide participants with a practical, five-step approach to restore trust in your critical systems after a data breach. Register today to join us for this informative webcast. Michael will also provide participants with a practical, five-step approach to restore trust in your critical systems after a data breach. Register today to join us for this informative webcast. Join us for this informative webcast! As a former QSA and currently a security analyst at The 451 Research, Adrian Sanabria will share a frank viewpoint of how the new version of Payment Card Industry standard will affect your organization. Gavin Millard, Tripwire's EMEA Technical Director, will discuss why effective vulnerability management is critical to measuring, managing and reducing your attack surface and how to gain insight from the information Tripwire can provide. Often during budget cycles, we’re handed a number – no choice or negotiation – this is just all you get. This year however, there are some positive trends in security budget research from Gartner, IDC, Ponemon, and CEB. This webcast will show you how to maximize your leverage of increased security spending, list the top three security budget mistakes and offer ideas that may help connect security to your organization’s bottom line. - Why is the Tripwire Vulnerability scoring so granular? - How do we arrive at those scores and why not just use CVSS? - What do you mean by business context of measuring risk? - How will it help us be more efficient managing risk? Please accept our apologies for the technical difficulties encountered with this webinar on Monday. This is now due to take place on Friday 4th October. Join Rick Holland, Forrester Senior Analyst, and Edward Smith, Product Marketing Manager at Tripwire, to learn how to go beyond scanning to a strategic vulnerability management program. • Go from counting vulnerabilities to accurately measuring, managing, and communicating risk. Join us for this conversational webinar featuring Jane Holl Lute, the new CEO of the Council on Cybersecurity, as she shares her thoughts on the rapidly evolving world of cybersecurity. As Security Management solutions evolve to address today’s environment of complex security threats, the need for a log intelligence layer has emerged to provide high speed analysis and filtering of log and event data. In this webcast, Steve Hall, Director, Product & Solution Marketing at Tripwire, discusses what’s new with Tripwire Log Center: including the new Advanced Log Collector VIA Agent and the integration of iP360, which intelligently protects critical infrastructure with the correlation of SANS top four security controls. Tripwire’s powerful IT security and compliance automation solutions help businesses and government agencies take control of their IT infrastructure.